Hi, I am interested in your 1969 Chevrolet Camaro (stock #5063-CHA) listed on Autotrader for $47,995. I'd like to get more information about this vehicle and confirm its availability. 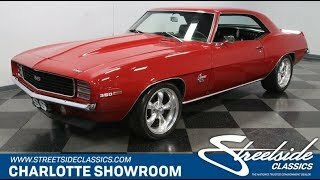 Whats better than a 1969 Chevy Camaro? How about one built to be a RS and SS packaged coupe with an aggressive exterior, comfortable A/C interior, and a shining performance-built stroker V8. Thats what takes a classic from great to all-around amazing. These are arguably the sexiest Camaros ever made. 1969 took the original Camaro styling and gave it a little more streamline design that includes the unmistakable kick up rear fender with an iconic Coke bottle design. It only gets better with the Rally Sport package with the blacked-out grille and headlights hidden behind the triple-slot door. The Super Sport touches always look great on this icon. After all, the front air dam, cowl induction hood, and D80 spoiler come together to make this an aggressive example of American V8 prowess. The factory-correct Garnet Red was resprayed for plenty of luster, and so it rivals the chrome for shine. Speaking of the brightwork, not only do you get mirror-like bumpers and trim, but also polished 17-inch American Racing Torq Thrust wheels. Inside is the perfect mix of performance and comfort. It starts with new seat covers so the black buckets look great against the exterior red. Its also apparent the carpeting and other interior components have been updated to give this a quality feeling. It has the kind of appearance that will make everyone want to go for a ride. Thats also why they gave this coupe great updates like an AM/FM/CD stereo w/Bluetooth and modern R134a air conditioning. But no matter how many people are in this Camaro, the best treats are reserved just for the driver. You get the iconic horseshoe shifter in the center console and classic Chevy three-spoke sports steering wheel for terrific grip. Beyond that, a full AutoMeter Sport-Comp gauge package instantly lets you know theres serious equipment under the hood. Grab your sunglasses before popping the hood, because you can see they made a serious investment in shine. Valve covers, master cylinder, alternator, piping, pulleys, and so much more have a great polished presentation. Everything else is finished in a slick black or bright red to give the whole engine bay an award-worthy look. There are even mirrors on the underside of the hood so you can really show this off! And behind all this flash is the substance of a strong-running 383 cubic-inch stroker V8. Its been further enhanced with a four-barrel carburetor, Edelbrock intake, an aluminum radiator, and long tube headers that feed the rumbling dual exhaust. More than just powerful, this is an all-around great cruiser with nice driving features like a three-speed automatic transmission, power steering, power brakes (with discs up front) and the grip of modern performance tires. This is a total package Camaro that takes the most iconic year and maximizes it for both show and go. Its the turn-key ready classic that has all the right features, so if youre ready to go cruising this weekend, give us a call today!